Ready to get your Irish on? DFW has many great Irish bars and restaurants where you can celebrate St. Patrick's Day or any day, really. 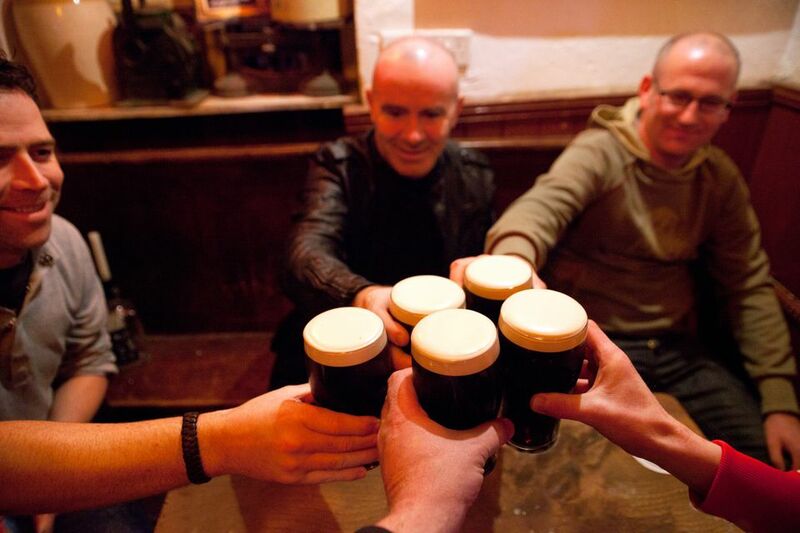 You can expect a warm, friendly atmosphere filled with hearty laughter and toasts from the Emerald Isle. But don't expect to hear your cellphone ring. Sláinte! By the way, the popular toast is actually pronounced "slaan-sha." It literally translates as "health". It's used as a short toast among drinking buddies that means "I drink to your health!" This is a family-owned Irish Pub. The amazing menu includes breakfast items that will put an "O" before your sir name. Try some Irish Eggs Benedict (2 homemade potato cakes topped with a hard boiled egg wrapped in seasoned sausage that has been rolled in bread crumbs and fried to golden brown. Finished with hollandaise sauce) or The Hungry Irishman (2 Irish bangers, 4 slices of smoked bacon, 2 fried or scrambled eggs, 2 slices of Texas toast, 2 potato cakes and baked beans). Now that's a hearty breakfast. Great kids menu too (pancakes, french toast, mac n cheese n ham). Traditional Irish foods like bangers 'n mash, Guinness Stew, Corned Beef 'n Cabbage and much more. We're hungry just writing about it. just writing about it. This is a great bar for watching parties for Cowboys, Bears, Jets, Saints and Gators but all fans welcome, Two Golden Tee machines and Buck Hunter, 12+ HD TV screens, free wireless internet access, Karaoke & Karaoke Tournaments, Comfortable patio (cooled when it’s hot, heated when it’s cool), menu served all the way until last call, great beer selection with daily specials,live music and DJs, live trivia on Tuesdays, Bingo Mondays, smoking seating available, Pool table. You will find Potato Skins here. The Corned Beef Reuben and burgers are most popular items. They have darts and Golden Tee. Local Austin Ranch delivery is available. This is an Irish owned and operated pub. Expect to see a large selection of imported beers and whiskeys, both Irish and Scottish. If you're a fan of stouts, ciders or porters, you've found the right place. This Pub may lean more toward a European-style pub but the bartender told us that they are heavily weighted in the Irish department. Their website features a photograph of a cold glass of Guinness and listed six Irish whiskeys, so that's close enough for us. The Old Monk is also an Irish-owned and operated pub (same owner as The Idle Rich) which features 16 beers on tap and over 100 bottled beers. The Old Monk is known for their fish and chips and Belgian-style mussels. Play some darts. 170-plus labels of beer and 22 types of Irish Whiskey. The extensive dinner menu includes lamb chops, prime rib, and pork loin. A Special Tasting Dinner Menu can be arranged for groups of 10 to 40 or more (must make reservation 24 hours notice). Located just off the Dallas North Tollway, it's Irish food and cold beer that will draw you in.